An extraordinarily bright and adventuresome tousled-blond intellectual from St. Louis, he enrolled at Columbia University in the early 1940’s. Living in the dorms at the Union Theological Seminary, he put on a Brahms record one day, thus earning a knock on the door from another eager young intellectual, Allen Ginsberg. They became close friends, and Carr introduced Ginsberg to the brewing Bohemian universe of 1940’sGreenwich Village. Lucien had a female friend, Columbia student Edie Parker, who was dating the recently-expelled Jack Kerouac. Lucien and Edie decided to introduce Kerouac and Ginsberg, figuring (quite correctly) that the two would find much in common. Carr was heterosexual but prone to adoration from men, and an older man from St. Louis, David Kammerer, had come to New York to pursue him. One day Kammerer introduced Carr and Ginsberg to another visitor from St. Louis, William S. Burroughs. Burroughs and Kerouac and Ginsberg had finally found each other, and began the weird escapades that would soon exhaust even Lucien Carr’s energy and interest. Carr had his own problems, too. David Kammerer’s obsessive pursuit of him had become so overbearing it was ruining his life, and Kammerer had begun to physically threaten Carr. One day Carr impulsively stabbed Kammerer to death by the Hudson River in Riverside Park, near the Columbia campus. Carr served two years in jail, and afterwards did something that completely violated Beat ethics and disgusted his friends. He got a job. He joined the United Press wire service as a reporter and remained with them through his life, advancing over time to increasingly senior positions. It is believed to have been a roll of Lucien’s teletype paper from the United Press that Kerouac used to type his legendary unbroken-sheet early draft of ‘On The Road‘ (although other accounts say it was a roll of wallpaper). 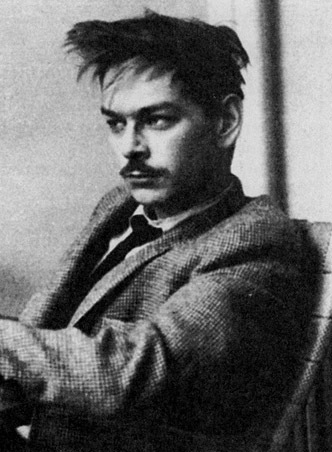 Lucien’s son Caleb Carr is the author of the acclaimed murder mystery ‘The Alienist.’ Caleb Carr met many of the Beats as a young man, though he claims to have received no literary inspiration from them or from his father. There may be more to this than meets the eye, however; ‘The Alienist’ is about a series of murders that take place on Manhattan’s waterfront in the distant past. It’s not true that Kerouac wrote *On the Road* on a roll of Western Union typing paper that he got from Lucien Carr. My source here is Isaac Gerwitz’s *Beatific Soul: Jack Kerouac on the Road*, published by Scala Publishers in London and essentially the catalogue for an exhibit currently at the Main Branch of the New York Public Library (the exhibit is there until March 2008). According to Gerwitz, Kerouac found rolls of architectural tracing paper in the apartment he and his new (second) wife Joan Haverty moved into shortly before Kerouac began writing the 1951 “scroll” version of *On the Road*. Kerouac cut the paper to size and scotch-taped together 12 pieces to make his 120-foot-long scroll. The Western Union myth makes a nice story, but it seems not to be true. First off, we don’t know, and never will know, exactly what happened between Carr and Kammerer that day in the late summer of 1944 when Carr stabbed Kammerer to death and dumped his body in the Hudson River. Carr later claimed he didn’t remember anything. This much is clear, though: Kammerer was pals with all the “beats,” with Kerouac and Burroughs and Ginsberg and Carr and Edie Parker and etc. They hung around together. It wasn’t as if Kammerer showed up from St. Louis only in order to stalk Carr. He wasn’t exactly a stalker, he was a member of the gang, and though he was 10 – 12 years older than most of them, they included him in their fun and games. It’s not like he was this weird guy following 20 feet behind them at all times in order to track Carr and never speaking to anyone. He was himself on of the “beats,” if by “beat” we mean everybody in that group who hung out in Edie Parker’s and Joan Vollmer’s Upper West Side apartment. And so when Carr killed Kammerer, it was as if one member of your gang of friends had murdered the other. It was very weird for everybody, and I’m not sure any of them got over it – especially Kerouac, who was still writing about it in his last book, published a year before he died.